see also details on UCC and NPWS websites. The official National Hen Harrier Winter Roost Survey, now in its third year, has been underway since October, collating sightings and roost watches all across the country. To date, approximately 70 sites where Hen Harriers frequent over the winter have been accounted for all thanks to the effort of volunteers and birders throughout the land. A number of Hen Harriers are seen frequently throughout the winter months in Waterford and co-ordinator Barry O’Donoghue is urging anybody with information on Hen Harrier roosts to contact him or Paul Walsh through this website. All roost locations are treated as highly confidential and should not be exposed to a large audience. All contributors are fully acknowledged for their support and circulated with the national report. Two relevant forms can be found on this website – one for casual sightings of Hen Harriers on your daily business and one for roost watches. Anyone wishing to learn more or interested in taking part can contact Barry at harriers[at]environ.ie. A joint project between National Parks and Wildlife Service, Irish Raptor Study Group and University College Cork is underway, tagging Hen Harriers to see where they go for the winter, how far they go from their natal areas, and where they end up breeding in subsequent years. Do they return to natal areas? Do they come back to the same sites year after year? In a bid to understand this, Hen Harriers are being tagged and ringed (under licence) as chicks. This year (2007) 45 chicks were ringed/tagged in 4 regions, namely the Slieve Aughties (4), West Clare (10), North Kerry (20) and Ballyhouras (11). All birds born and tagged in 2007 have a RED tag on their left wing. From this, we can tell how old the bird is in future. The tag on the right wing identifies where the bird has come from. AUGHTIES - BLACK, WEST CLARE - GREEN, NORTH KERRY - RED, BALLYHOURAS - YELLOW. Each individual bird has its own number or letter written on both tags. The tagging colour scheme can be seen on the downloadable sheet below. At least 2 tagged Hen Harriers have been seen by locals in Waterford this winter – both from the Ballyhouras Mountains in Co. Cork. It is just a matter of time before their roosts are found in Waterford, it is just a matter of having the right people in the right place at sunset on a winter’s evening. 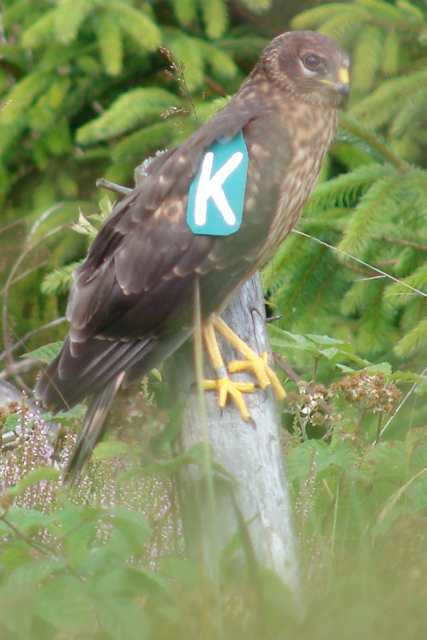 harriers[at]environ.ie with any sightings, tagged or untagged, interest in Roost Survey or for further information.